It appears that trying to CPU mine is putting a beating on my Mac. CPU usage associated with the wallet is about 95%. The fan is constantly turning. Is there a way to limit this to something like 50%? Don't want to damage my MacBook Air. What do you think? ... Suggestions? Thanks ... Any plans to create a Mac version of the PoS wallet? I'm looking for a pool. Please can you send me pool link. always getting rpc call failed. I don't think that miner is 100% compatible with Noblecoin, since the performance it reports in benchmark is far higher than the built in wallet's reported performance (My Core I7-3740 reports about 14000 hashes/sec in the Qt wallet, but the standalone miner reports about 58000 kh/sec. Seems unlikely that a few compile time switches can account for such a wide disparity in performance. 20%, 50% speedup, maaaaybe. 410%? No. These two mining engines cannot be using the same algorithm. How do you use your wallet to mine? BitBill.eu Pay all your Bills with Bitcoin or one of the other accepted cryptocurrencies. | EthereumMiner.eu Cheap, fast and stable Ethereum Miners. ahh! didn't have that one even form all the other coind's I've made. Sorry for off topic since one is asking. Try this miner (more efficient than built-in miner): https://github.com/magi-project/m-cpuminer-legacy-v2 You can compile it on mac os. RPC-Port is the default value or the one you set in conf file. USER and PASS are the rpc username and password, and need to be set in conf. Yes, it works. We removed many condition checking which occurs rarely as well as tweaking of gmp computation, that made the leap, while we remained the wallet algo the same for reliability. If you'd like to mine, external minerd is highly recommended. I've been reading this: " https://github.com/eagleflies/noblecoin/wiki/Importing-private-keys-from-old-wallet.dat-using---salvagewallet-option " over and over again and I just don't understand the part 5. ... So to begin with, I had a PoW wallet ENCRYPTED on my PC#1 so I downloaded a new PoW wallet without encryption to my PC#2 and sent all my Nobles from my PC#1 to my new wallet on my PC#2 which is not encrypted and everything went fine. Then I back-upped my wallet.dat from the PC#2 PoW wallet and copied that wallet.dat to my PoS wallet roaming folder. But what I need to do next? Where do I put that "-salvagewallet" command? 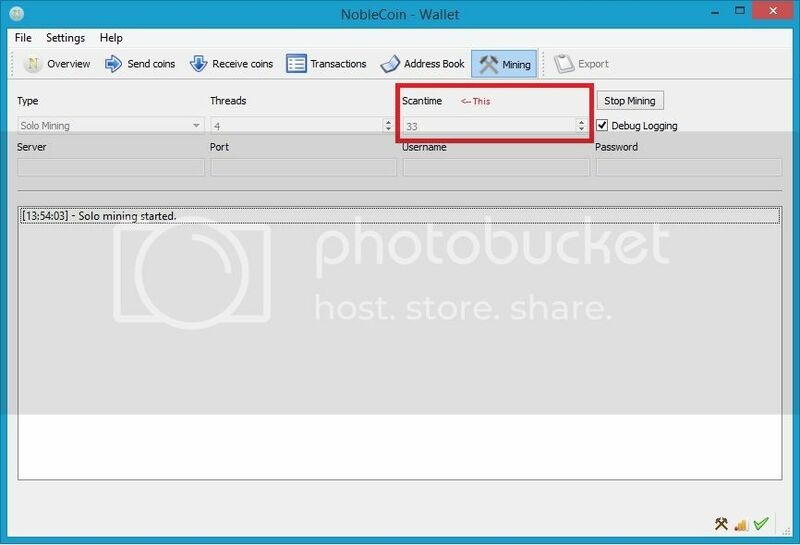 I tried to start my PoS wallet just by clicking the PoS noblecoin-qt and the program just crashed like I thought and then I added the -salvagewallet command after the noblecoin-qt.exe like this "noblecoin-qt -salvagewallet" and started it but it gave me an error report and crashed. So where do I put that -salvagewallet command or is there somewhere some salvagewallet.exe which I need to run? Thanks. The important question is have you sent the money before the switch? IF afterwards it does not matter and money is still in encrypted wallet. Documentation was written before the switch and presented option of transferring money to unencrypted wallet. But now this option does not exist anymore. I have updated docs to present current options. Yeah, I did it today. I'll try this https://github.com/eagleflies/noblecoin/wiki/Manual-way-of-importing-private-keys when I get home. Will report how it went. I did import the private key to the PoS wallet, but nothing happened. No funds added to the wallet. Then I tried again and it said "Error adding key to wallet (code -4)" So what's the meaning of that code? I guess I did everything right at the first place and now that I'm trying to repeat it gives me error for that. edit. It did add the address from my PoW wallet to the PoS wallet's "receive coins" section. There are now two addresses. One is the original PoS wallet address and the other one is the PoW wallet address. My mistake, you are right it does work. Wow, I am at almost 25% of total hashpower now, according to netmhashps. I doubt that will last long! To stake out a configuration file should I do? Hello, brand new to noble coin and I'm only lightly familiar with cryptomining in general. I've downloaded NobleCoin and I've attempted mining, but I haven't noticed any deposits so far. 1) I was wondering how best I can mine NOBLs? 2) Should I join a pool, and if so, what are some good pools that still work? I see a lot of dead links. 4) How do I know when I've earned NOBLs thru mining? 5) Does anyone have any cheesecake here? And if it helps any, my system is an i5-2500K @ 4.2 GHz with a GTX 650Ti BOOST 2GB graphics card. 1. if under windows just use your wallet. I do not think it makes sense to invest lots of effort into setting up mining etc since our PoW mining will shut down in 3 weeks. 2. There is no pools AFAIK. 4. Look at 'Recent transactions' or go to 'Transactions' and see if you mined 1000 coins. So I've got it as you said, basically I just should leave it an come back in 3ish weeks? I can understand I'm getting 8kh/s. This is what I mean by scantime. Should it be lower, higher, etc? default is 99, I set it at 33 because I read on a blogspot post somewhere that that was recommended; I don't know why tho. DEBUG: [3 thread] Found share! Any idea what's wrong? Is this just a typical orphaned block or might I have some settings misconfiguration? I fixed the above, so no help needed on that. But I have now another question, please tell me if I am misunderstanding how stake rewards work - I remember the Dev estimating in this thread that after the POS switch, Coin emission should drop from about 7.2 MM NOBL/day under POW, to about 0.5MM/day under POS-II. But there seem to be many rapid and huge stake payouts being generated, much much faster than that. What you are seeing is the total amount of coin/input that was used to create the POS block. If you click into one of those blocks you will see what Generation + Fees that were the POS reward. So the above block 4395 used 1,000,208.60839707 NOBL and got 106.19839716 as their POS reward. Thanks, that clears it up nicely! It's confusing to see POW and POS rewards in the same format in that block explorer's history list, when they are really indicating very different things. in this situation reward percent per stake (probable per day) is just 0.01%. Is this real percent?